New state and federal laws seek to prevent antibiotic resistance in both humans and animals. A review of herd health and treatment programs may reveal opportunities to decrease medication costs. While Antimicrobial Resistance (AMR) has existed for millions of years, modern use of antibiotics has stimulated increased drug resistance of bacterial pathogens in both animals and humans. In order to help prevent the development of AMR, the veterinary and animal agriculture sectors are adapting medication practices which mirror requirements already in place in human medicine. As of January 1st 2018, a prescription from the herd’s veterinarian will be required to purchase any “medically important antibiotic”, meaning an antibiotic that is also used in human medicine. California’s new law expands the national requirements implemented in January 2017, requiring veterinary authorization for use of medically important antibiotics in feed or water. 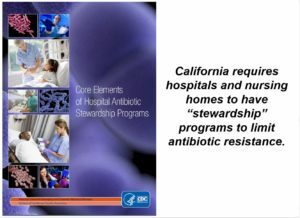 While Over-The-Counter sales of medically important antibiotics in California will cease in 2018, antibiotics for control and treatment of disease will continue to be available (with a prescription) through several avenues. Reviewing the dairy’s medication program with your veterinarian may reveal several avenues for cost savings. These include selection of the most cost-effective drug for a given disease condition and choosing the most cost-competitive retail distributer. The greatest opportunity for cost savings are typically related to disease prevention. 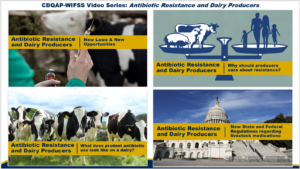 CDQAP has developed a series of four short videos explaining why the prevention of antibiotic resistance is important to dairy producers and how disease control programs and tailored treatment programs may reduce drug costs. CDQAP has developed videos explaining why antibiotic resistance is important to producers and how tailored treatment programs may reduce drug costs. Bacteria are all around us, on the tools we use and in the food we eat. 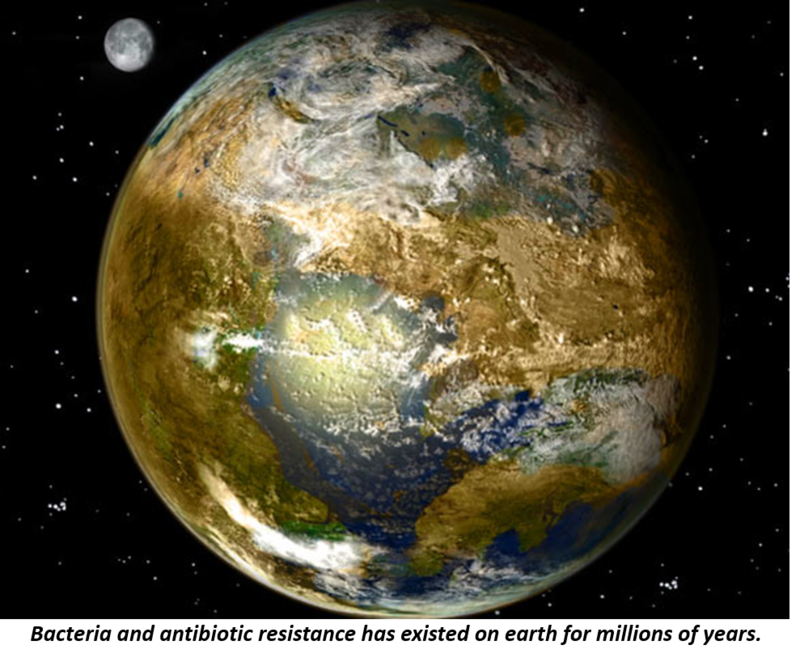 In fact, the total weight of microorganisms on earth is greater than that of all plants & animals combined. We actually may have as many normal, protective bacteria on our skin and in our GI tract as we have human cells. Bacteria have been around a lot longer than humans, for at least 3 billion years. In a struggle for dominance over the millennia, some microorganisms developed chemical weapons (“antibiotics”) for use against their neighbors, who would in turn develop defenses against them, becoming “resistant” to those antibiotics. We have found antibiotic resistant strains of bacteria in pristine caves and in the remains of wooly mammoths, demonstrating resistance was present thousands or even millions of years before humans started using antibiotics in the 1940’s. The United Nations’ Food and Agriculture Organization (FAO) has concluded that that the most significant factor in the emergence of resistance in humans is human treatment and prevention. In fact, recent research suggests that antibiotic resistance more often starts in humans and moves to animals. It is clear however that it is the use of antibiotics in both people and animals that stimulates development of resistant bacteria in the environment. This has led to increased frequency of antibiotic treatment failures in both people and livestock. Antimicrobial resistance remains a growing public health concern. The Center for Disease Control estimates that every year there are more than 2 million illnesses due to bacteria resistant to antibiotics, infections resulting in some 23,000 deaths annually. Faced with this growing threat, the medical community has embarked on a massive effort to slow the spread of resistant bacteria. Aside from research, there has also been extensive outreach efforts directed at both doctors and their patients. There have also been programs mandated to limit resistance. 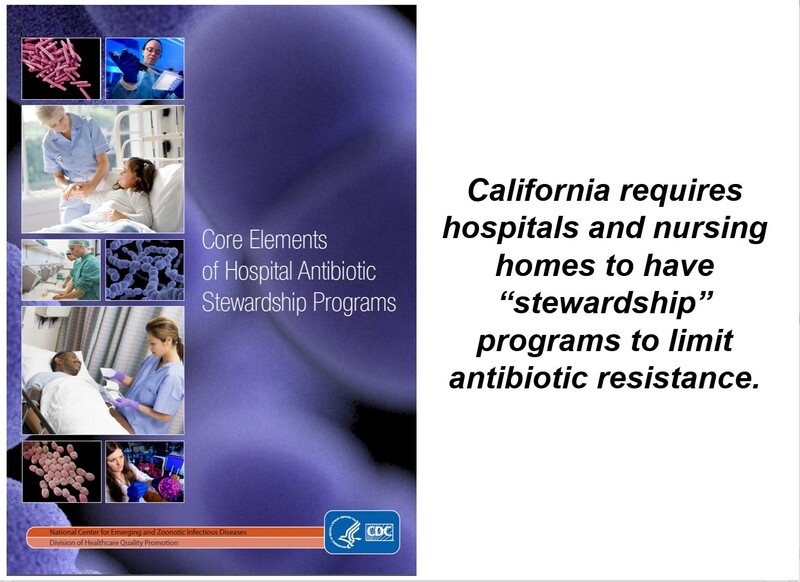 In California for instance, every human hospital and nursing home is required to have antibiotic stewardship programs in place designed to limit antibiotic resistance. As of January 1st, 2018, a prescription from your herd veterinarian will be required to purchase any “medically important antibiotic”, meaning an antibiotic (or its class) that is also used in human medicine. The new state law expands on similar national regulations enacted earlier in 2017 requiring veterinary authorization for medically important antibiotics in feed and water. The newest California law, however, mandates veterinary oversight of not only antibiotics in food and water but if administered by an injection or bolus as well. There must be a regular herd veterinarian. For California producers their veterinarian must be licensed to practice is the state and acting under a valid Veterinarian-Client-Patient-Relationship, or VCPR. The specific requirements for a VCPR vary by state. In California a VCPR is defined in Section 2032.1 of the State’s Code of Regulations. Briefly, having a VCPR means that the veterinarian is overseeing the medical care of the herd’s animals and is directing the herd’s medication program. 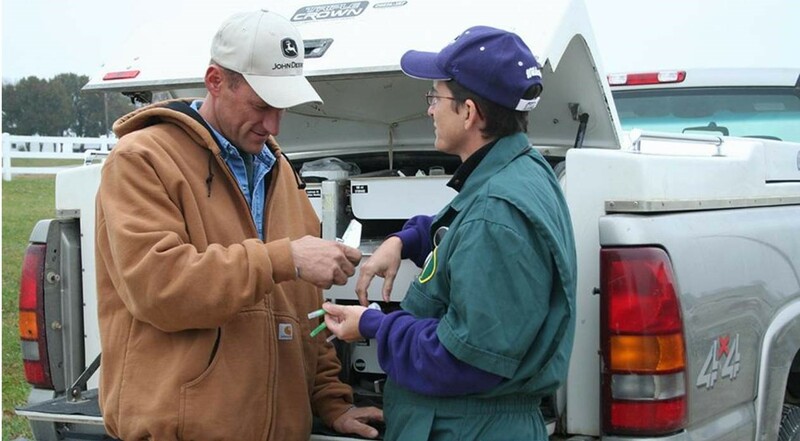 A VCPR requires first-hand familiarity with the farm’s operation and must include regular farm visits. Internet pharmacies do not meet these requirements. Medically important antibiotics require veterinary authorization. Regardless of the product formulation, the herd veterinarian must provide authorization for purchase of a medically important antibiotic. This means either a prescription for an injectable, bolus or water product or a Veterinary Feed Directive (VFD) for antibiotic products mixed in feed. Antibiotics may be purchased directly from the herd veterinarian. If the herd veterinarian maintains an adequate inventory and has competitive prices, some producers may choose to purchase directly from the vet’s practice. Some veterinary practices provide complete service for livestock medication purchases, even including daily delivery. Importantly however the veterinarian must have a VCPR (as described above) with the producer. Veterinarians cannot fill prescriptions from veterinarians outside of their practice. Antibiotics can also be purchased through a licensed retailer. A producer may request that his herd veterinarian provide a prescription (by phone, fax, email) through one of approximately 20 Veterinary Food-Animal Drug Retailers or VFADRs currently licensed in the State. A California Board of Pharmacy website allows producers to search for a local VFADR, or producers can simply click “Find” to review a list of all licensed VFADR retailers in the State. Typically, VFADRs can ship product directly to a producer by FedEx, UPS or company transport within 24 hours. Some VFADRs also have brick-and-mortar locations where medications can be picked up. Some internet purchases are allowed. In addition to the VFADR’s licensed in California, several internet veterinary product retailers are licensed by State Board of Pharmacy as pharmacies rather than simply as VFADRs. Properly licensed internet pharmacies can ship orders of medically important antibiotics to locations in California as long as the herd veterinarian provides the company with a prescription. Producers making internet drug purchases should be cautioned that not all internet pharmacies comply with state or federal laws. Those that do can be located on the Board of Pharmacy’s main pharmacy list. In the future other licensed “human” pharmacies (Costco, Walmart, Amazon) may also choose to market food animal medications. While less of a concern for dairy operators, some local human “home-town” pharmacies may also be willing to fill orders for small, remote operations. Producers can shop for the best price. 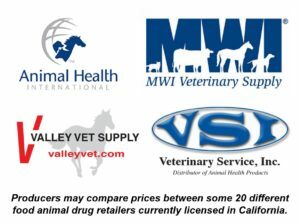 Since by California law, a veterinarian may not charge for providing a prescription, producers may wish to review product prices from different retailers and choose the most competitive price. Purchase of antibiotics from “feed-stores” is greatly curtailed. Historically in California there have been some 300 retail locations licensed to dispense over-the-counter livestock medications. As described above, retail sales of medically important antibiotics will be limited to companies that are licensed by the State Board of Pharmacy to market those products. Disease control is still permitted. While “regular pattern” preventative use of antibiotics is restricted by law, use of antibiotics to treat or control disease conditions is still permitted. Producers will want to discuss with their veterinarians what this means for their treatment protocols. HOW WILL THE NEW LIVESTOCK LAW EFFECT PRODUCERS? 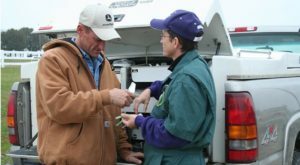 California dairy producers should experience only minimal disruption to their operations primarily because most dairy producers already have a herd veterinarian available to provide prescription medications or VFD orders. In addition, the only products currently added to feed of adult dairy cows (monensin, some parasite and bloat preventatives) do not require a VFD order. Thus, the most noticeable change for some producers will be having to obtain a VFD order either for the use of medicated milk replacer or for use of antibiotics in feed to address periodic conditions of young stock such as an outbreak of respiratory disease. Preventing disease. As described below in the section on decreasing medication costs, preventing disease is always cheaper than treating it. CDQAP has an extensive library of resources to assist producers select the most cost-effective disease treatment and prevention practices. Using non-antibiotic options. Some non-antibiotic practices used to treat or prevent disease (like vaccination and footbaths) are useful strategies for minimizing antibiotic use and treatment costs. As with other aspects of your herd health program, your herd veterinarian can work with you to determine which non-antibiotic treatments are appropriate for your specific dairy. Monitoring pathogens. 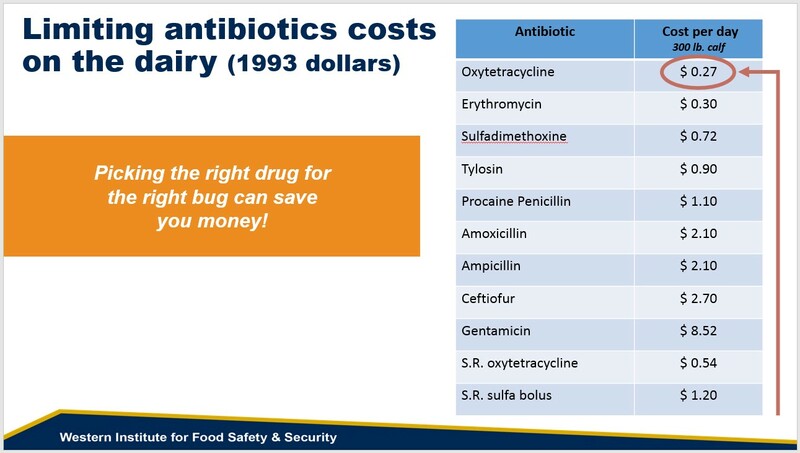 As described below in the section on decreasing medication costs, herd veterinarians can periodically culture bacteria from infected animals to determine which antibiotics the strain is sensitive to. The advantages of this are two-fold: 1) It prevents spending money for medication and labor that are ineffective and 2) It also allows selection of the cheapest antibiotic that will still get the job done. Reducing antibiotic use when possible. A review of treatment programs may reveal opportunities to reduce or eliminate some antibiotic use. A producer may choose, for instance, to implement a selective dry-cow therapy or targeted antibiotic treatment for calf scours. Before implementing such changes producers will want to consult closely with their veterinarian since some options will not be appropriate for some operations. Using the lowest-tier, narrow-spectrum antibiotics when possible. Each dairy has different resistance patterns, with some antibiotics working well on some dairies and potentially failing on others. 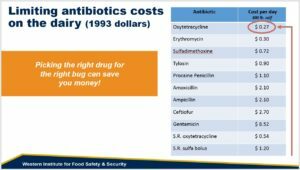 Some older, lower-tier antibiotics (when they are effective) may be less costly than some newer, broader spectrum antibiotics. When appropriate selection of older, work-horse antibiotics may reduce medication costs while saving the newer, more expensive ones for when they are really needed. Partnering with your herd veterinarian. Herd veterinarians are critical to constructing a dairy medication program beyond simply providing prescriptions and VFDs for medically important antibiotics. Virtually every aspect of the herd’s health program benefits from having veterinary involvement, including biosecurity, sanitation, disease monitoring, vaccination and nutrition. Decreasing disease incidence. A typical case of clinical mastitis (considering decreased production, discarded milk, labor & medication costs, early culling and even impaired reproduction) may cost between $100 and $200. Similarly, when considering production losses and treatment costs, an average case of lameness may set a producer back $400. The California Dairy Quality Assurance Program has an extensive library of resources dealing with disease control and animal care issues, all focused on identifying the most cost effective practices yielding the biggest return-on-investment. Price comparison. As described in the medication law section above, producers may compare prices for medications from some twenty retailers and several Internet licensed by the State Board of Pharmacy. By state law a veterinarian may not charge for providing a prescription so if price advantages are identified a producer may choose to source from more than one company. Picking the “right drug for the right bug”. Using regular herd visits, laboratory tests and periodic post-mortem examinations, your veterinarian can document which disease conditions are present on your facility and (when caused by bacteria) which antibiotics the bacteria are sensitive to. This assists you and your vet in selecting the most cost-effective, lowest-tier, narrow-spectrum antibiotic that will still eliminate the pathogen on your dairy. In the example used in our third video for instance, there can be a ten-fold difference in daily medications costs for a 300-pound calf being treated for calf pneumonia. CDC’s “Get Smart” Program to improve stewardship in human medicine.